← How should I do if I lost the VeryPDF software serial number? For describing the contents in PDF document more clearly, you may need to use some kind of content elements in the document. Such as some kind of draw shapes. 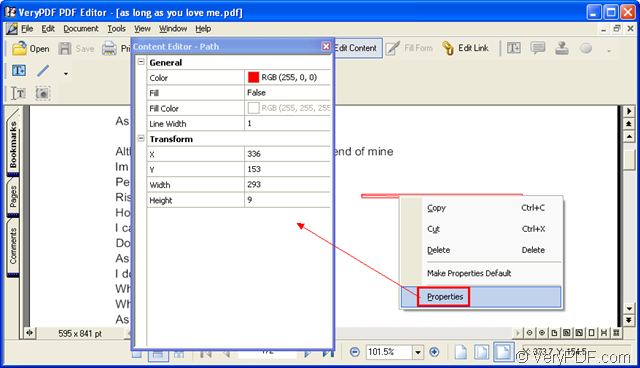 For example, you can edit or add the line, rectangle, ellipse or other draws in your PDF document. If you want to know how to edit pdf line, please read this article which will show you the detailed steps. 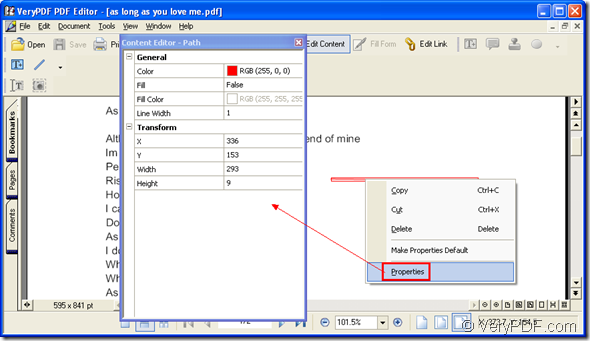 The application tool you need to use is PDF Editor. You can download it at the following URL: www.verypdf.com/pdf-editor/pdfeditor_setup.exe. When installing it on your computer, you just need to follow the installation wizard to fulfill the installation. If you want to buy PDF Editor, please enter its homepage at http://www.verypdf.com/app/pdf-editor/index.html. Just open the application PDF Editor via double clicking the icon of it or right click the icon and click “Open” option in dropdown list. You can also click “Start”—“All Programs”—“VeryPDF PDF Editor v2.6”—“VeryPDF PDF editor” to open the application. Then please open the PDF document in PDF Editor. Use the hot key “Ctrl”+ “O” to open “Open” dialog box in which you can select the PDF document to be edited and add it to PDF Editor. You can also click “File”—“Open” or click “Open” button in the toolbar to open the same dialog box. If there are some pdf line contents in the document and you want to edit some of it, please click “Edit Content” button in the toolbar or click “Tools”—“Edit Content” to open the content status. Then please click the line in PDF document with your mouse until you can see a red rectangle framing the line, which means the line is editable now. Please see it in Figure 1. You can drag the rectangle to move the line to any place in the document pane. You can also right click the rectangle and choose “Copy”, “Cut”, “Delete”, etc. options to edit the pdf line. In addition, you can click “Properties” option to open “Content Editor-Path” dialog box. You are allowed to set the line color, line width, and the start coordinate for the start point of the line. When you finish editing, please click close box. You need to click “Save” button in the toolbar or click “File”—“Save” to save the changes you have edited to save the new pdf line. You also need to create a new PDF document. Just click “File”—“Save as” to open “Save as” dialog box in which you can rename the file and specify the location for the new PDF document. How to fill PDF form from image information? This entry was posted in PDF Editor and tagged pdf line. Bookmark the permalink.